(c) 01 Jan 1996-31 Mar 2003 Pensioners. (d) Pre 01 Jan 1996 Pensioners. (e) Death case while in Service. (f) Loss of 32 Kb 85 64 Kb Cards. (g) Post Apr 2003 Retiree not a member yet. (h) 16/32 Kb Card Holders. 2. All the above categories except 16/32 Kb Card holders are required to download online generated temporary slip. This Temporary Slip is required to be taken to the nearest polyclinic for activation alongwith all related service documents for ECHS membership. The Temporary Slip was earlier valid for three months and subsequently extended on monthly basis. 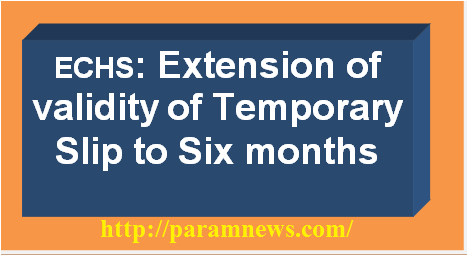 (a) All system generated Temporary Slips will be abinitio valid for Six Months. 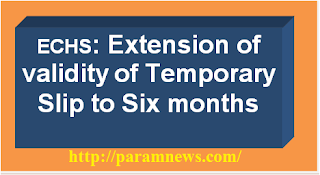 (b) The Temporay Slip can be further extended by three months at a time by Parent Polyclinics in case the ECHS beneficiary does not receive the Card. (c) The ECHS beneficiary to collect his Card from Station Headquarters within 30 Days from receipt of OTP. These slips will be handed over to the Station HQ at the time of collection of Card. 4. All Regional Centres will forward copy of this docu to all Station HQs & Polyclinics in their AOR.